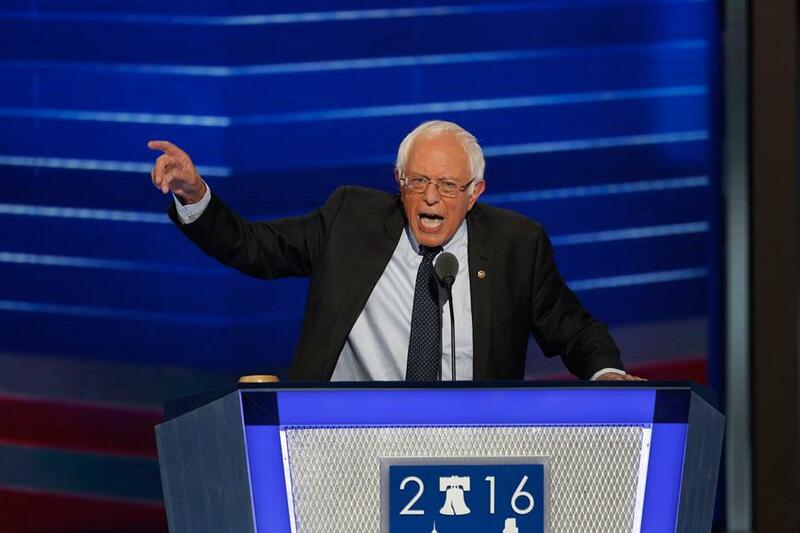 Bernie Sanders speaks passionately on the first night of the Democratic National Convention on July 25 in Philadelphia, Pa. Some Northwestern students are not abandoning their support of Sanders even though he did not win the Democratic nomination. Eugene Debs died in 1926, but that won’t stop Camren Ward from considering writing in the name of the socialist politician on Nov. 8. Ward voted for Bernie Sanders in the Illinois Democratic primary but said he will not vote for Hillary Clinton in the general election. “It’s kind of a throwaway, but I have the luxury of that being from a non-swing state,” the Weinberg junior said. Ward said he is starting a chapter of the Young Democratic Socialists, an organization with chapters at colleges nationwide, at Northwestern. He said the club has been approved by the University and has five members so far. Weinberg junior Charles Blackstone, a member of the group, said Ward will likely serve as the president of the NU chapter, which is awaiting approval from the national headquarters. Aside from the current members, there are “a dozen or two” other students who have shown interest, Blackstone said. Although Blackstone, Ward and Jalil Khoury, another member of the group, are all registered as Democrats, they said they won’t necessarily vote for Democratic candidates in future elections. Blackstone said the Young Democratic Socialists don’t have to support Democrats and instead can act as a third-party option. “The bipartisan system has become so stale that it’s sending a message that these third parties are legitimate,” he said. The three students all said they support Sanders and are not sure if there is a current candidate who shares their viewpoints on a variety of issues. Khoury, a Weinberg sophomore, said he does not trust Clinton on several issues, and he hasn’t decided if he will vote at all next week. Other students who support Sanders expressed different reasons for disliking Clinton as a candidate. Blackstone said his issue with Clinton does not come down to trust. “It’s…do I want to see third-party candidates have some legitimacy in the nation, or do I want to vote for someone who for me is safer than the other option?” he said. Blackstone said he had socialist views before Sanders launched his campaign, but he became more interested in socialism after coming to NU. Although Khoury and Blackstone are having a tough time grappling with whether or not to vote for Clinton, neither of them has considered voting for Republican nominee Donald Trump. Khoury said the decision to not vote for Trump was an easy one. According to the polling website FiveThirtyEight, Clinton has about a 71 percent chance to win the election. In Illinois, she has a 98.5 percent chance of winning. The last time Illinois voted for a Republican presidential candidate was George H.W. Bush in 1988. Due to the likeliness of a Clinton win in Illinois, Sanders supporters like Ward are not very worried about who to vote for. Ward said he would consider voting for Clinton if he lived in one of the swing states, where the election is expected to be close. Ward said he doesn’t think Clinton will fight for the policies she says she adopted from Sanders, such as debt-free college, but said Sanders pushed Clinton to the left despite not winning the Democratic nomination. He said even though Sanders is considered a democratic socialist, he would’ve liked Sanders to be even farther to the left. Blackstone said his political beliefs fall to the left of Clinton, and he’s deciding whether to vote for her or Green Party nominee Jill Stein. He also related his political ideology to Karl Marx.